The Online Learning and Distance Education series publishes practical titles for self-managed professional development; textbooks for graduate and upper undergraduate courses; and resources for use in training university faculty, corporate, and professional staff in workshops and other in-house training settings. Under the guidance of Michael Grahame Moore, this will provides the quality of resources needed for study, research, practice, and training. Published in Association with The Online Learning Consortium. Social presence continues to emerge as a key factor for successful online and blended learning experiences. It is commonly described as the degree to which online participants feel connected to one another. Understanding social presence—with its critical connections to community-building, retention, and learning outcomes—allows faculty and instructional designers to better support and engage students. 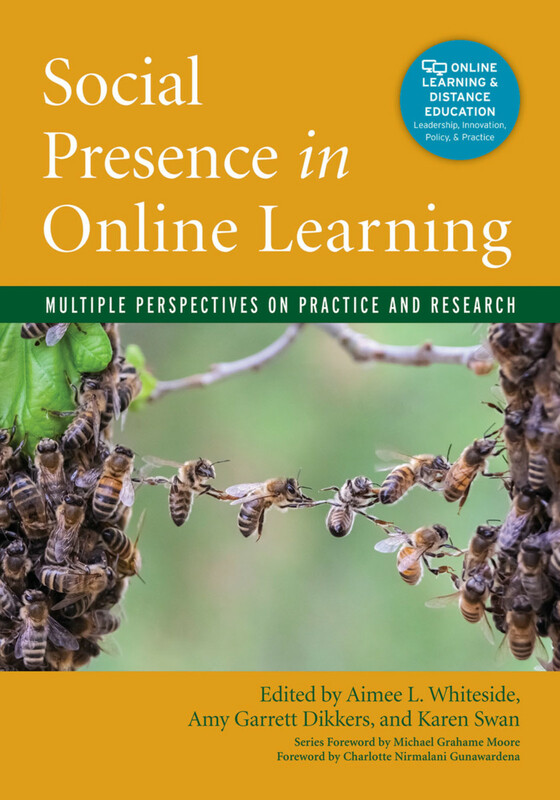 This volume, Social Presence in Online Learning, addresses the evolution of social presence with three distinct perspectives, outlines the relevant research, and focuses on practical strategies that can immediately impact the teaching and learning experience. These strategies include creating connections to build community, applying content to authentic situations, integrating a careful mix of tools and media, leveraging reflective and interactive opportunities, providing early and continuous feedback, designing with assessment in mind, and encouraging change in small increments. Because student satisfaction and motivation plays a key role in retention rates and because increased social presence often leads to enriched learning experiences, it is advantageous to mindfully integrate social presence into learning environments. Social Presence in Online Learning is appropriate for practitioners, researchers and academics involved in any level of online learning program design, course design, instruction, support, and leadership as well as for graduate students studying educational technology, technology-enhanced learning, and online and blended learning. It brings together multiple perspectives on social presence from the most influential scholars in the field to help shape the future of online and blended learning. "Social Presence in Online Learning represents the most comprehensive research to application effort so necessary in the field of online learning. From Dr. Michael Moore’s hopeful Foreword through chapters on establishing foundational language, the applications to blended learning, personalized learning, and the role of supporting technologies, this work covers the breadth, depth, and promise of social presence in any instructional format! A must have for anyone desiring to craft an engaged and connected online learning community." "The principals of this book are leaders in the field and this thoughtfully crafted collection of research and best practices related to social presence is impressive. These scholars, along with the distinguished authors of the chapters, have presented compelling guidance that bolsters this foundation of online learning. I strongly encourage educators to explore the insight shared in this extraordinary volume to inform their practice to the ultimate benefit of faculty and students." "Social Presence in Online Learning is of great importance to those in the field of online and blended learning. The insights provided in this book make it clear that social presence represents an essential element of any collaborative learning experience – online and otherwise. The comprehensive treatment of the social presence construct makes this book an key resource for those interested in online learning. My congratulations to Aimee Whiteside, Amy Dikkers, and Karen Swan." "Social presence is widely recognized as an important strategy in developing online and blended learning environments. The high quality research and practical applications explored in this book inform educators and ensure that social presence is well-understood. My congratulations to the authors for illuminating the intricacies and nuances of this critical pedagogical approach." Aimee L. Whiteside is an assistant professor at the University of Tampa where she previously served as interim co-director for her university’s Center for Teaching and Learning. Her research interests include social presence, blended and online learning, technology-enhanced learning, experiential learning, academic-community partnerships, and professional writing. She has been featured in several peer-reviewed journals, including the Journal of Interactive Online Learning (JIOL), Online Learning Journal (OLJ), International Journal of E-Learning and Distance Education (IJEDE), EDUCAUSE Review, and the Online Learning Consortium’s Effective Practices. Additionally, she has written chapters in several books, such as Emotions, Technology, and Learning and Computer-Mediated Communication across Cultures: International Interactions in Online Environments as well as chapters in special volumes in the Advances in Research on Teaching and the New Directions in Teaching and Learning series. Amy Garrett Dikkers is an Associate Professor in Educational Leadership at the University of North Carolina Wilmington. She studies online and blended learning across the spectrum of Pk-20 educational organizations. To date she has over 20 publications that examine the value of online and technology-enhanced education for diverse populations of students and the teachers who work with them. Karen Swan is the Stukel Professor of Educational Research at the University of Illinois Springfield. For the past 20 years, she has been teaching online, and researching online learning. She is a recipient of the Distinguished Award and she received the Online Learning Consortium (OLC) award for outstanding individual achievement and the Burks Oakley II distinguished online teaching award for her work in this area, and is an OLC Fellow and a member of the International Adult and Continuing Education Hall of Fame.